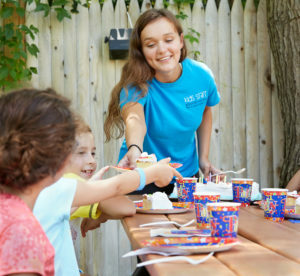 Host your next birthday party at Dedham Health! We work hard to make your events a breeze! You choose the date, invite the guests and trust us to do the rest. From set-up to breakdown, we cater to every your every need. Our events staff is trained to ensure a successful event! Your party includes 1 hour of organized FUN and EXCITEMENT lead by our professional party staff with the party theme of your choice. PLUS! 30 minutes in our private party room which includes set-up, breakdown, and everything in between! Be a sports star! Your child can now have their pick of their favorite sport for their perfect birthday party! Whether they are most comfortable in the water, on land or even up in the air your birthday child and their friends will have a blast playing organized games and doing challenging activities! Pool Party – Enjoy 3 hours of fun in the sun at the area’s most unique swim and tennis club! Parties at The Summer Club enjoy use of the Dueling Waterslides, Wave Pool, Zero Depth Area, Lap Pool, Splash Pad, Motorized Bumper Boats, Pirate Ship, Island Oasis, Ropes Course* and so much more! Memorial Day – Labor Day. Click to learn more. Ropes Course Adventure – Whether you’re scheduling a corporate outing or you’re searching for the ideal teen party venue, our ropes course adventure is sure to be a hit! Seasonal. Click to learn more.